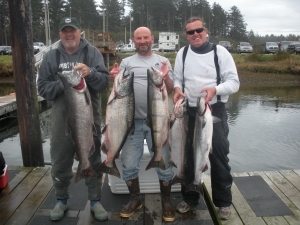 Get ready for the guided fishing trip or charter of a lifetime with expert guide Randy Lato, from Forks, on the Olympic Peninsula, the northwest corner of Washington State. For the river’s, I have a 2016 17’ Willie drift boat. It is equipped with heat, front and back, for those chilly days. An incredible fly fishing boat. It can accommodate up to three customers comfortably (two with fly rods). For the low water conditions and getting to those less populated stretches of river. I have an Outcast raft. It is limited to two customers. My ocean vessel is a speedy, custom 28’ Olympic with a fully enclosed heated cabin and a stand-up head. Equipped with brand name electronics to put you on fish. It is a great five-man boat. Corporate accounts or large groups? 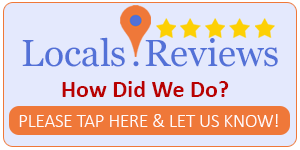 I work closely with other reputable guides in the area to accommodate. All boats are clean, licensed and equipped with all safety gear required. I am USCG licensed and first aid/CPR certified. I accommodate to all skill levels from novice to the most experienced. Last but not least, the fishing gear is brand name. I like using light gear and letting my customers have a great time. I have lived in the Forks area since 1968. I grew up fishing the Olympic Peninsula rivers and the salt water that borders it. 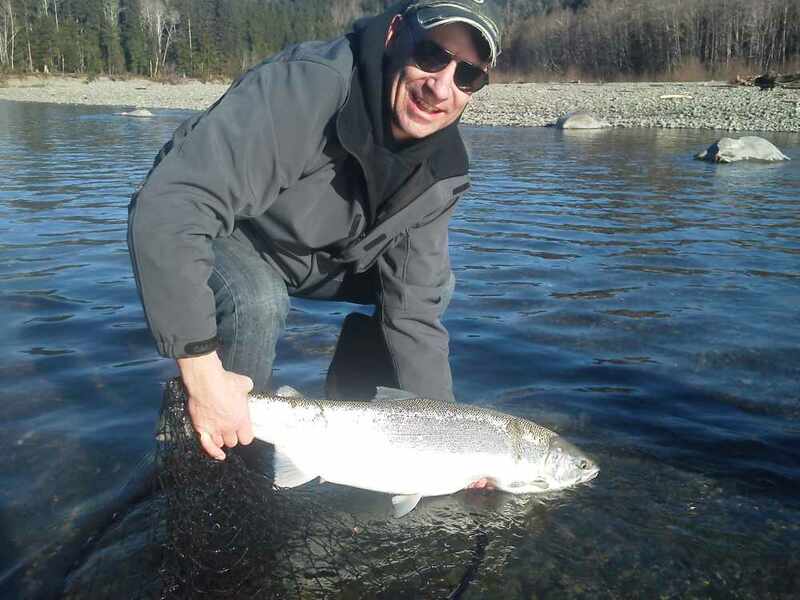 We have a hatchery runs of steelhead and native runs of steelhead. The hatchery fish run in Dec and part of Jan. The native run starts in numbers in mid Jan and run through April. The native steelhead is a catch and photo fishery. 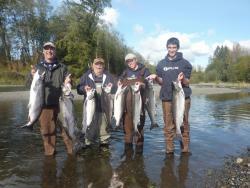 The Olympic Peninsula is home to some of the best salmon fishing on the continental United States. The Rivers of Washington State's Olympic Peninsula have been a favorite for anglers around the world. 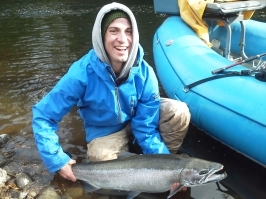 These Rivers offer King and Silver Salmon as well as the Olympic Peninsula's Famous Steelhead Trout. In Oct. and Nov. the rivers are stuffed with kings and silvers. The kings can run up as large as 50 lbs and silvers in the 20lb class. The coast line of Washington has been a real fan favorite for years and it offers many species of fish, marine life and scenic opportunities. It has given anglers the chance to catch a king of a lifetime with lots of smiles and fish for the cooler its a awesome experience. King salmon fishing off the coast of Washington is and has bean proven to be one of the best salmon ports on the west coast. I call La Push my home port, La Push is the home of the Quileute tribe, just minutes from Forks on the Olympic Peninsula. I have fished out of this port since I was a kid and know and respect it well. 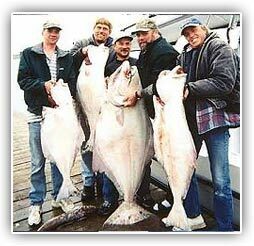 The Halibut Fishing off the coast of Washington State's Olympic Peninsula is excellent! Our Halibut Fishing Charters provide anglers with a world class opportunity to catch these great fish. Halibut are one of the most sought after species in the ocean, they are good fighters on the end of the line and awesome on the grill. 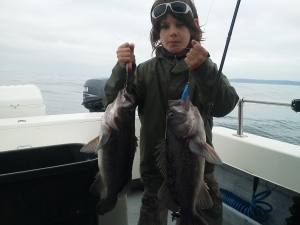 We fish Halibut in the most popular Washington off shore waters, the Canadian waters that require you to go to Canada to get your fishing licnese and in the Straits of Juan DeFuca. The tuna fishing off the north coast has become real popular with the salt water anglers. The albacore tuna is a awesome fish to battle, they are so fast and strong. The time of year is late summer. This is Mid Aug. and Sept. when the warm water is close to the shore. We keep close tabs on the water color and temp. for the best action. 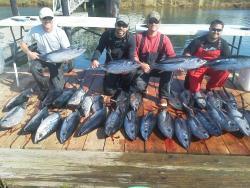 The Albacore tuna fishing has become very popular on the west coast the last few years and become my favorite fishery. When its happening the fish are hitting the deck. We just day fish for the tuna go out early and return late afternoon. The lingcod fishing in the ocean is great. This is the fish we caught of Sunday April 11 out of La Push. The water was calm and the weather was great. We will be able to fish off shore for these fish till late May then a 20 fathom depth restriction is set on the coast. 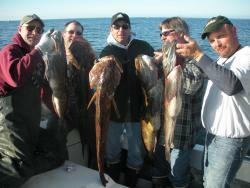 The limit is 2 lingcod and 10 sea bass, its a great time and will produce a good amount of fish for the freezer. The Sea Bass fishing on the ocean is great. This is a very popular fishery for a family adventure, close to shore, light gear and lots of fish. Fishing for sea bass is easy for all members when we find a school of bass we lower jigs to the bottom and real them up or plastic on lead heads either way its fish on. Scenic Ocean and River Tours are also available, the scenic beauty and wildlife of Washington's Coast is unbelievable. The Gray whales will be along the WA coast in April. In the summer we will see the Humpback whales further of the coast. And on occasion a pod of Orca whales will pass through. For kings the most popular method is back trolling Kwick Fish plain or wrapped with a sardine fillet. I fish the deeper holes but you have to have adequate flow to make them work and dive well. If there is no current I will use floats and eggs. Trolling for kings I like to troll at 1.8 – 2.0 knots using Hotspot flashers and hoochies (immitation squid) or spoons. Some of my favorite hoochies are the green splatter back, the Seahawk (green & blue) and the purple haze with a white glow flasher, which is very productive. I will use others but these are my favorites. Side drifting is one of the most popular methods in conventional steelhead fishing. This can be done with a combination of bait, yarn and rubber worms. This method runs your gear alongside the boat for a longer, more natural looking presentation. On my guided trips I set up all my gear in the same manner to achieve maximum effect. Also learn about drift boat fishing: pulling plugs and driftboat fishing: spoons and spinners!